Here is some information on how to repair a leaking roof. When your old roof starts to leak and you need to repair it and not replace it there are a few things you can do. Every year your roof is aging and there is not much you can do about it. It is typical in|Vancouver BC, Canada. a 30 year roof will only last 20 years. It is typically based on where you live, the trees around your home, if it is more exposed to the sun or wind or what type of roof you have or how it was installed. When you live in an area that can affect the life of your roof it is prone to leaking. Hiring a professional roofing company when your roof starts to leak is important. Making sure they do the repair properly is even more important. Just slipping a shingle under the area that is leaking typically wont work. It can also cause more damage and you may end up calling more then one company to come fix your roof. The correct way to repair a leaking section of roof is starting bellow the leaking area, and adding shingles over top of the old shingles right to the peak of the roof and under ridge cap. 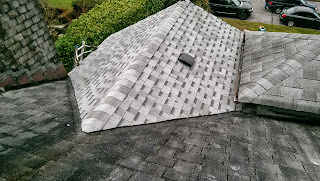 If the leaking section is not visible you should install shingles over the entire area affected.